In the last article we began to discuss the important role our abdominal muscles play during physical activity, and how this should guide our abdominal training. To summarize, the abdominal muscles are stabilizers, not movers. Their job is to resist movement, rather than create movement. However, the abs do much more than resist excessive lumbar extension in the sagittal (linear) plane. Another important function to consider is how they work to resist rotation about the spine in the transverse plane. Just as we don’t want our spine to be excessively flexed or extended, we also don’t want too much rotation about the lumbar spine. Rather, rotation should come about the hips and the thoracic spine. Like when a baseball batter swings, or when a hockey player takes a slapshot, power is generated by rotation about the hips and the thoracic spine. When it comes to power development, Shakira was right, the hips don’t lie. With this in mind, it makes sense that throughout development of rotational power via rotation of the hips and thoracic spine, we must also work to develop our core to resist rotation at our lumbar spine. 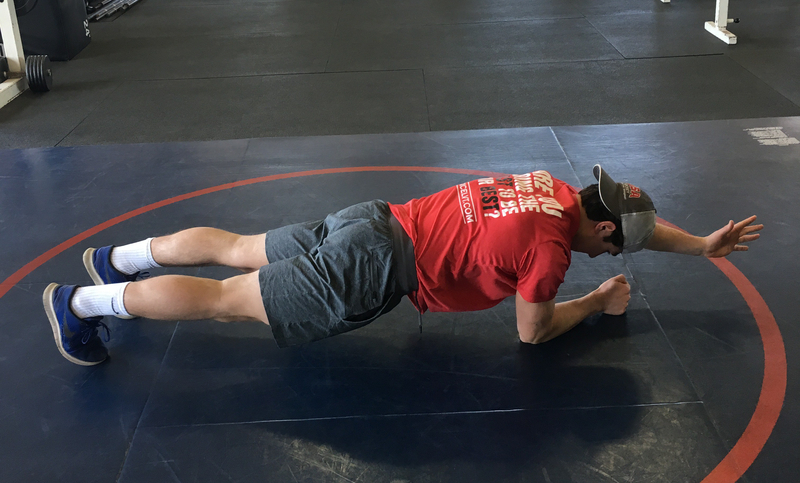 Three-point plank variations, beginning with the plank with reach is not only the simplest way to begin to learn anti-rotation, but also a great progression from the front plank. To begin, the athlete sets up in a perfect front plank, remembering all the cues we use to prevent excessive lumbar extension and maintain a neutral spine. From there the athlete reaches one arm out, keeping that perfect plank position. With the limb lifting up, the body searches for a way to redistribute your weight. Your spine will want to rotate and shift weight into the opposite hip. So it is your job to resist this movement and keep everything perfectly stable just like the regular front plank. Alternate arms every rep.
With resisted antirotations, once again we set up stable with a neutral spine, keeping our abs tight. The resistance from the cable will cause your core to twist as we try to resist movement. Focus on the breath and slow exhales. 1 set with 4 breaths will be difficult provided we’re focusing on extending those exhales as long as possible. A big mistake I commonly see is not bringing the cable out in front of the body. In the side view you can see I’m actively trying to extend my elbows. That’s really it. When starting out with this concept, keep it simple. Antirotation progressions can begin as soon as antiextension exercises (plank and rollout) have reached proficiency. As always, if you have any questions/comments/suggestions please reach out. Stay tuned for the third and final part of the this series where we’ll talk about antilateral flexion.